Hüttschlag is a village in Großartal of the Pongau area of Salzburg. 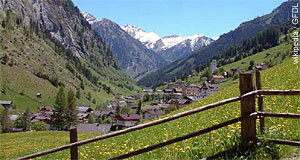 Like most towns in the Pongau, it is famous for skiing holidays and hiking. Hüttschlag has a population of approximately 950 and is situated in the Großarltal valley, one of Salzburg′s finest skiing areas, which is strongly linked with the Gasteinertal valley in the Skischaukel Großarltal-Dorfgastein. As a skiing destinations, the Großarltal including the ski lifts of Hüttschlag is a member of the Ski Amade, one of the biggest skiing areas of Austria. In terms of sightseeing, Hüttschlag has relatively little to offer. Visitors come to this place for hiking and other Alpine sports during the summer. During the winter, it is obviously skiing that draws the crowds, but also the vicinity to the thermal springs and spas of Bad Gastein and Bad Hofgastein. In Hüttschlag itself, you can have a look at the parish church St. Josef., a so-called "Talmuseum" (a museum dedicated to the local history of the valley) and to an information office on the National Park Hohe Tauern. The latter is not to be confused with any of the official visitor centres. A natural "sight" of Hüttschlag (or rather a feature that limits your view) is a mighty cliff that the village faces. Historically, Hüttschlag′s origins can be traced back to the Middle Ages. The Großarltal was first mentioned in a written document in 930, in following decades the Prince Archbishop of Salzburg gradually seized power over it. It was a very remote and rather insignificant place until well into the 14th or 15th century, when mining started around Hüttschlag. In 1520, copper ore mining gained importance and new facilities were created in today′s Hüttschlag. The name relates to a hut for ore processing (Hütte) and a little wood that was cut down (Schlag) - "Hüttschlag" could be translated as "where a forest was cut down to build mining and ore processing facility". Over the course of a few years, the lucrative mining business allowed the new settlement to prosper. This boom period was interrupted in the 17th century, when the Reformation spread among miners and peasants (the former were actually not peasants at all, but relatively well-paid professionals) rioted and fought the central power of the Prince Archbishop. Protestants were expelled from Hüttschlag, the community lost half its population. However, this was little compared to the closing of the mines in 1863: This resulted in severe economic problems and Hüttschlag′s population dropped from 2000 to 470 within a few years. Only with the rise of skiing tourism after WWII, Hüttschlag recovered and is now once a gain a wealthy place. Since 1991, parts of the municipality are part of the National Park Hohe Tauern.